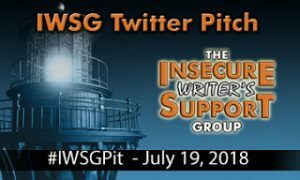 The awesome co-hosts for the April posting of the IWSG are: Olga Godim, Chemist Ken, Renee Scattergood, and Tamara Narayan! Sorry for the late post! The hosting company had problems with the server which affected all the blogs hosted by the company. It got fixed about five minutes ago… literally! I’m in the home stretch of my #100words100dayschallenge! YAY! Only 6 days left! Back to my writing balloon… only 5 days left! Writing every day for 100 days is not easy… but it’s an amazing experience… one I may attempt again in the hopefully-not-too-distant-future! Glad you finally got it fixed! Now, just five more days and you are a hundred day challenge champion. Congrats on the #100words100dayschallenge! You go! Hosting issues happen, frustrating, but it happens. 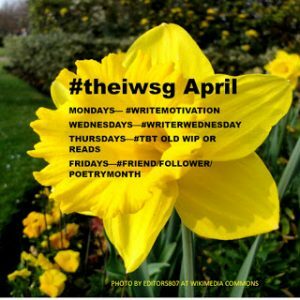 Congrats to you on the writing challenge! I know you will complete it with no trouble at all. You’re a winner! Congrats on accomplishing your challenge. Awesome that you made it! Glad the server issue got resolved. Good luck with those last six days! Good job getting to the home stretch. Glad you got your server fixed too. Hope you have some celebrations planned. I hope you managed the last six days of your challenge! Hi Michelle!!!! Congrats on finishing the challenge! I am sooooo proud of you! Missed you popping over to my blog… I have some FUN and ‘It’s about time,” news…. I started a NEW writing project… A memoir of an UNBELIEVABLE woman. I currently have a teaser at my blog. 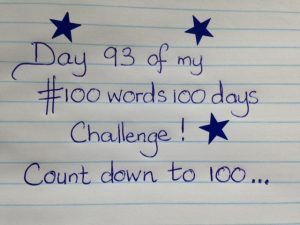 I’d love to know what you think… this is the first piece of real writing I have done in over two years…..
That is so awesome about the 100-day challenge, Michelle! Congratulations! And now that you’re in the groove, maybe this will become a habit… Was it Vonnegut or Bradbury that said writing every day—like every single day—is the key to mastering the craft? I believe it. I notice that when I go a long stretch without writing, whether it’s journals or on the blog or something I’m working on, it gets harder, somehow… Sure, the words don’t flow as easily, but also the imagery, the metaphors, the plot twists… Creativity really is a muscle, and the more we exercise it, the stronger it gets. Kudos to you, my friend! BRAVA! Well done on the 100-day challenge, what an achievement! I really ought to do something like that.